As you may know, for the past three years, I drove a Honda Pilot. But my sister drove a 2002 Toyota Camry LE, which got totaled this summer, so she got the Pilot. 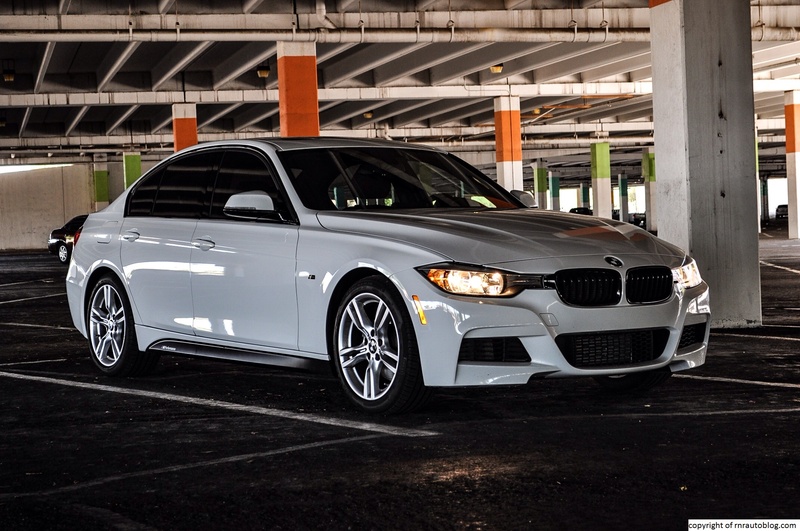 What I may not have mentioned is that since August, I have been driving a 2010 BMW 328i sedan (It’s my dad’s) . It was quite the change, as I actually have to worry about huge dips and speed bumps and what not. But I embraced the svelte inline six cylinder engine and the sublime handling. 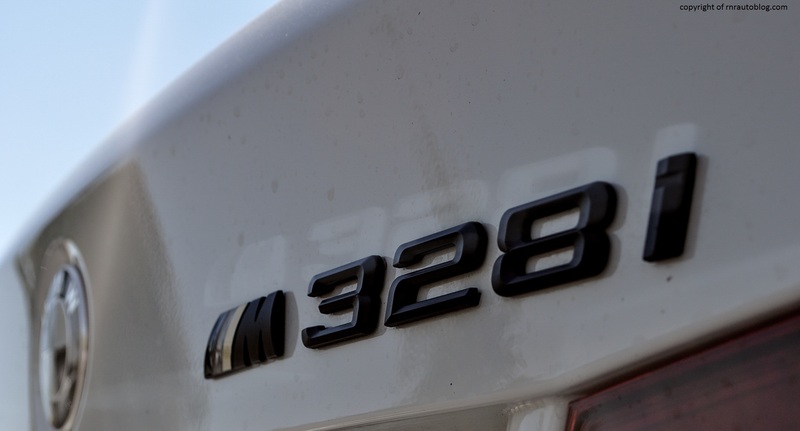 The 328i (I named her Gisele) is the last 3-Series they produced with the heavenly hydraulic steering. I know it seems trivial to obsess over a steering system, but that is what makes a BMW feel like a BMW. In other words, the steering is weighty and it is brimming with feedback. That is why when I got the opportunity to review the latest 3-Series, I approached this car with dread as it was going to be hard for me to remain objective. After all, I arrived to do the review in an E90 (3-Series’ are classified by their generation names. 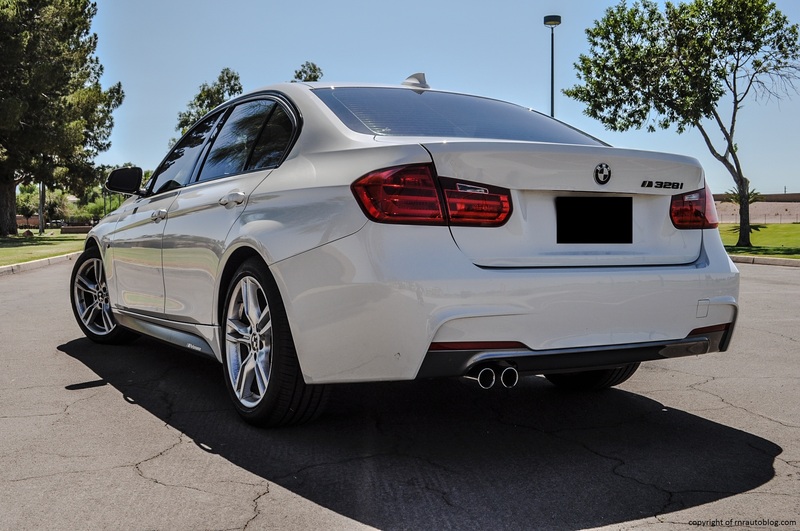 E90 is from 2006-2011, and F30 is 2012-present), review a F30, then leave in an E90. But what really made me approach the F30 with trepidation is the fact that the F30 replaces the amazing hydraulic steering system with an electric system. After reading reviews stating the obvious lack of feel in these new electric steering systems, I tried to approach this car with an open mind. I should explain: previous 3’s were not particularly fuel efficient, so BMW saw fit to install an a more fuel efficient electric system in the F30. 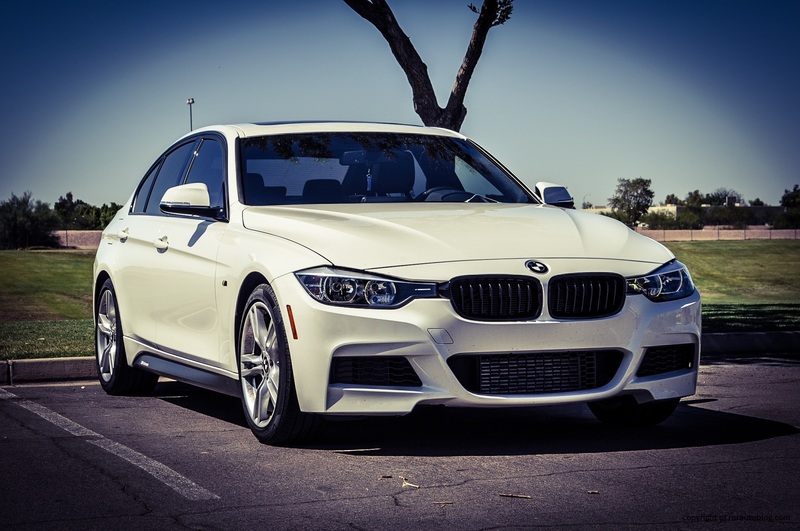 The 3 series has a long history dating back to 1975 which when the first generation launched. 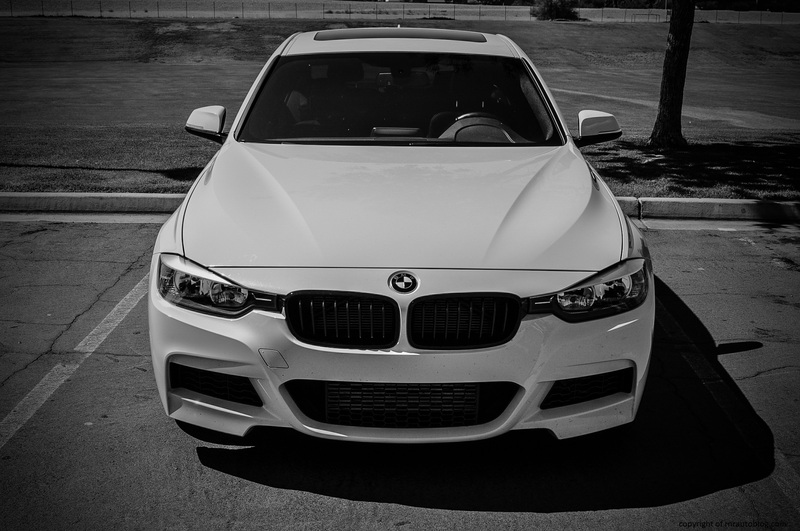 Since the first generation, the 3 series has solidified its reputation as the best compact luxury sedan in the world. For five generations, it has remained supreme in terms of sales despite the emergence of worthy competitors. Now, it is going to be hard not to be biased. But I am going to try to be objective with the review of this car. 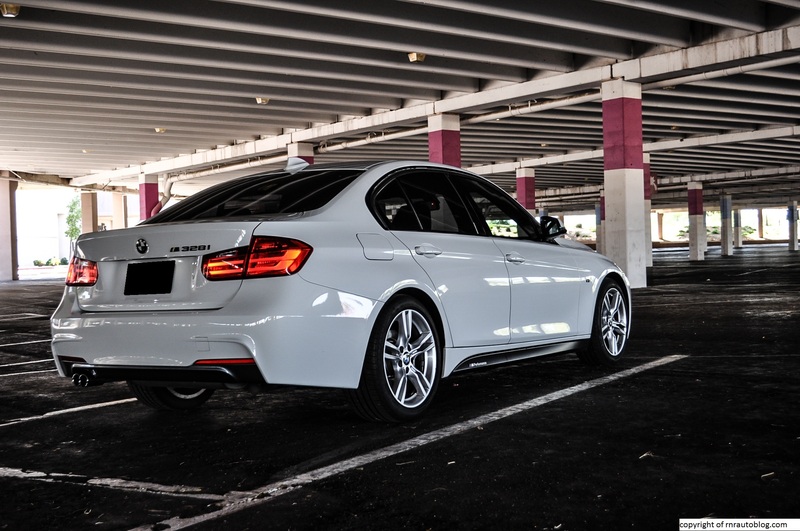 It is just that I arrived in an E90 to test drive a F30, and I left in an E90. Can’t be that hard to remain objective right? I have reviewed the third, fourth, and fifth and I have loved them all, so hope was high that I would become fond of the sixth generation. 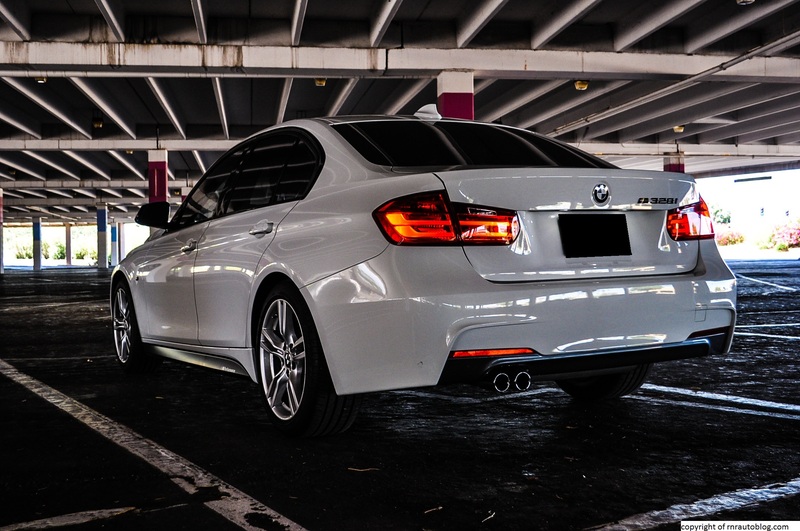 To a normal person, this F30 might look sporty and sleek. The attractive wheel designs and the blacked out logos give it a sense of exclusivity. For this generation, three lines (think trim levels) are offered: Sport, Luxury, Modern. 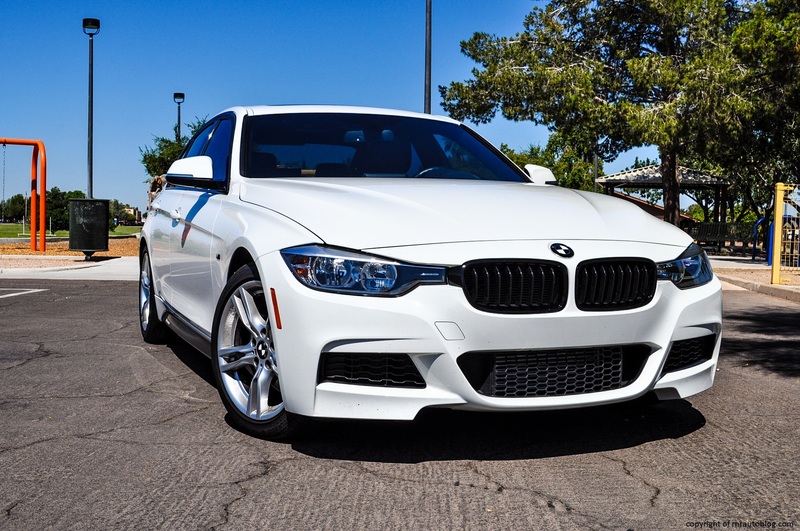 However, this 3 Series has the M Sport package, which adds BMW’s high performance division M’s exterior modifications and suspension upgrades. The M sport line, which includes the aforementioned blacked out logos and wheel designs, a unique front and bumper design as well as side skirts, aids this car’s sporty persona. 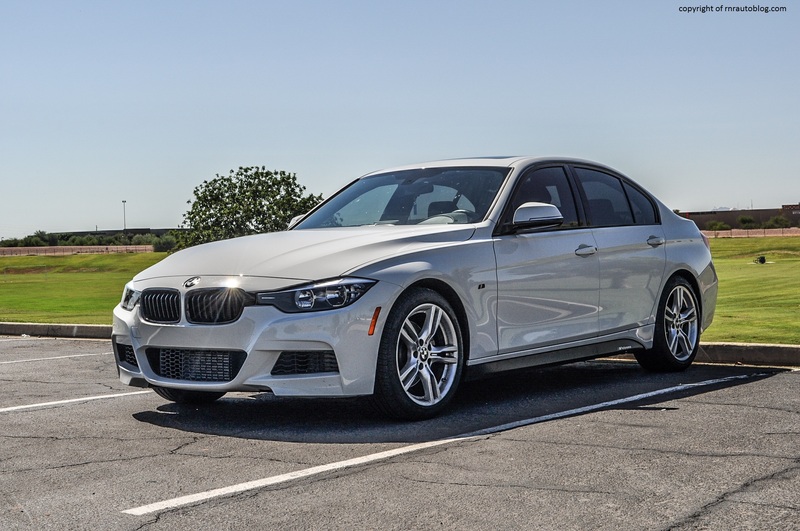 However, to a guy like me who has been accustomed to BMW’s traditionally staid and understated sedans, this F30 generation represents a break from the norm. It is not that it is a bad looking car, on the contrary, it is a decent looking car. However, it just doesn’t have that handsome look that BMWs are known for. The headlights are the subject of controversy of this design, especially when they are tangent to the grille. They look fussy and overdone, and the bumper is full of lines that mar its otherwise simple fascia. Th BMW signature kidneys grille does fit in well however, and the hood lines add some visual interest to the front. The side profile is defined by a distinctive character line that leads to the taillight. 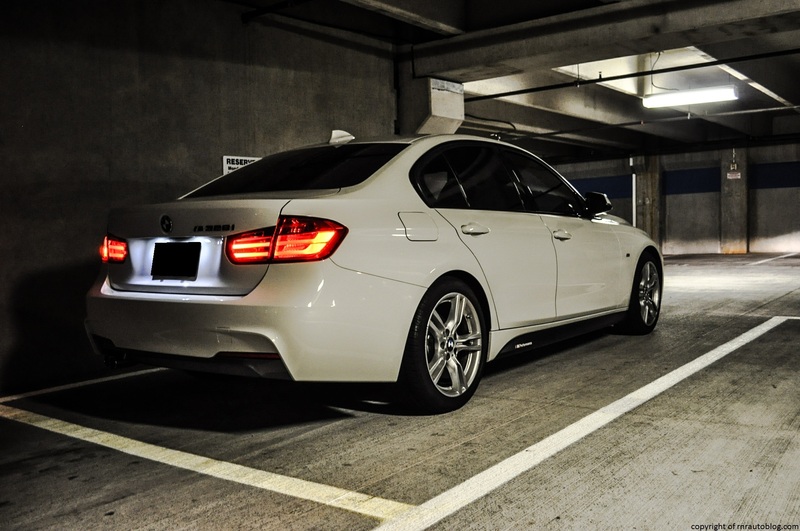 The upright roof line remains as does BMW’s signature “Hofmeister Kink” (the kink in the rear window line). When looking at the rear, my eyes are drawn to the bumper. I actually like it. I like how the edges of the bumper rise and then disappear towards the center, and the diffuser is distinctive as well. The interior has a business tone to it, and it is filled with dark colors. However, there is a driver-centric feel to it with the wraparound dash and the controls facing the driver. The light colored surfaces help brighten up the interior, and I like the blue line that runs in the middle of the dash. 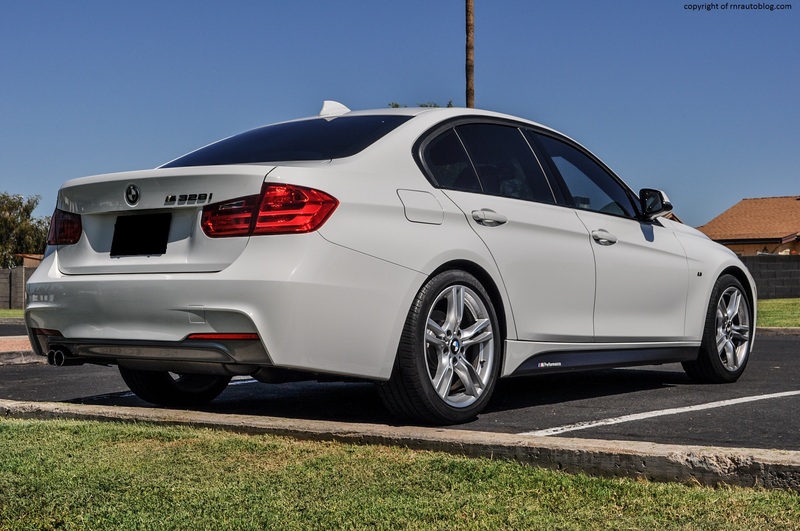 This M Sport comes with an adaptive suspension with “M sport tuning” and variable assist steering. Judging from a non BMW enthusiast perspective, the F30 is a lovely thing to drive. The steering is responsive, and it corners with limited body lean, and it feels taut and tied down. The steering is finger tip light at parking speeds. 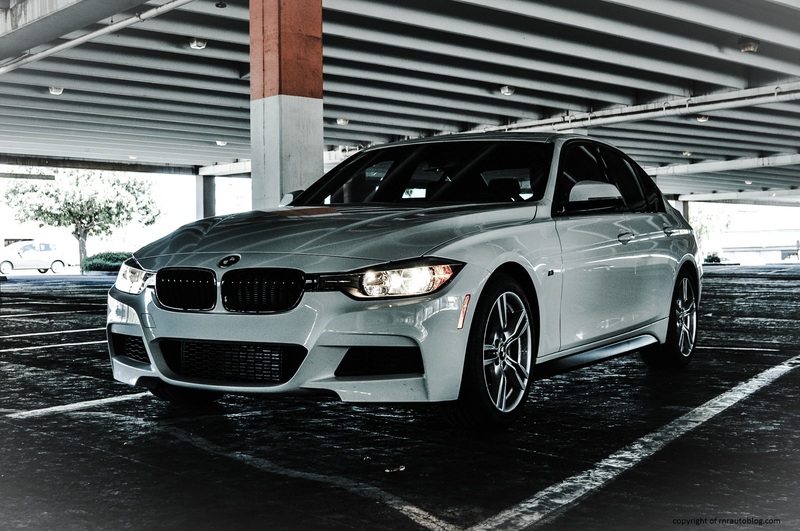 However, judging as someone who currently drives an E90 3-Series, the benchmark for compact luxury sedans in terms of driving pleasure, this F30 comes up a little short. This is going to be harsh, but I assume you readers value honesty. One of the reasons I love my E90’s hydraulic steering setup is because of how much road feel it provides. I am always in touch with the road surface through the steering, and it makes turning a whole lot easier. For example, when I am making a left turn at an intersection, I can judge by the road textures how close I can get to the concrete barrier (the divider in the middle of the road) without actually touching it. Sadly, in this F30, there isn’t any feedback. The steering feels disconnected, and not only that, the new electric steering removes the traditionally heavy steering weight. The steering feels disconcertingly light, and while that may appeal to most people, I prefer the steering to feel like it is substantially connected to something. However, the steering is quick and precise, and it does have the body control down pat. However, the lack of steering feel and overly light steering makes it feel like it is bigger than it actually is. 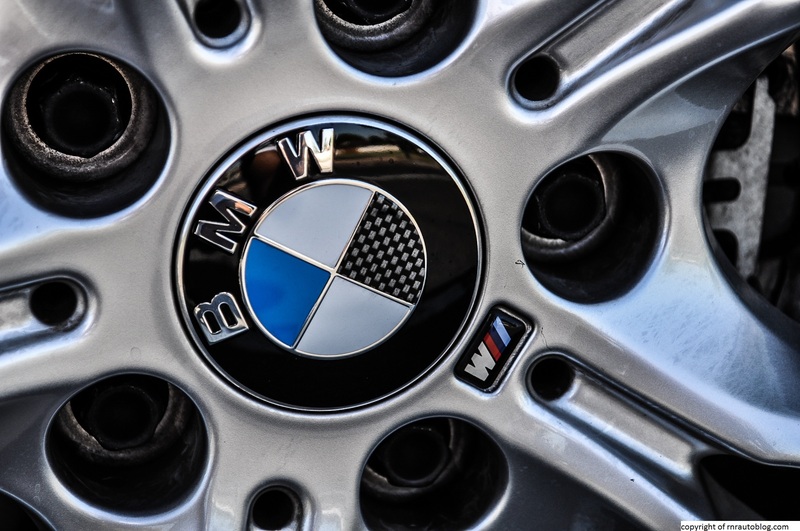 I can’t explain it, but it does not feel as willing as you expect a BMW to be, and the connection between the machine and driver is somewhat diluted. With that said, the ride quality is cushy. 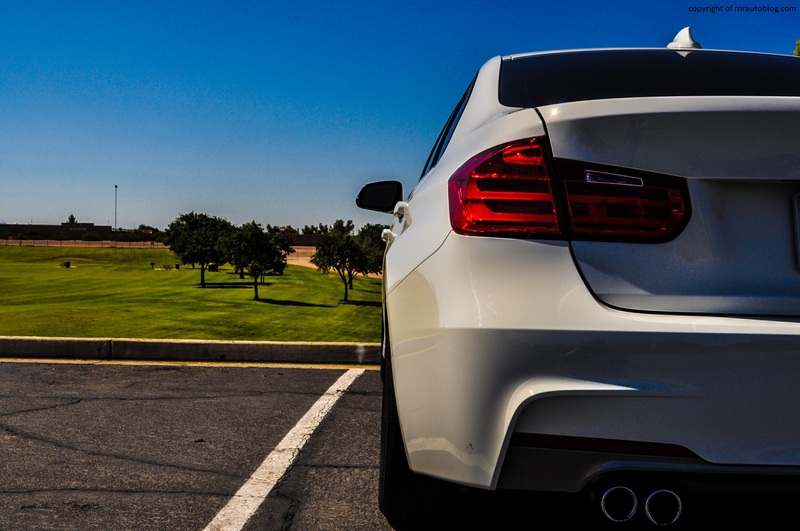 It suppresses bumps very well with less firmness than the E90. The larger brakes that come with the M Sport package provide exceptional stopping distances, and the brake pedal is firm and direct. 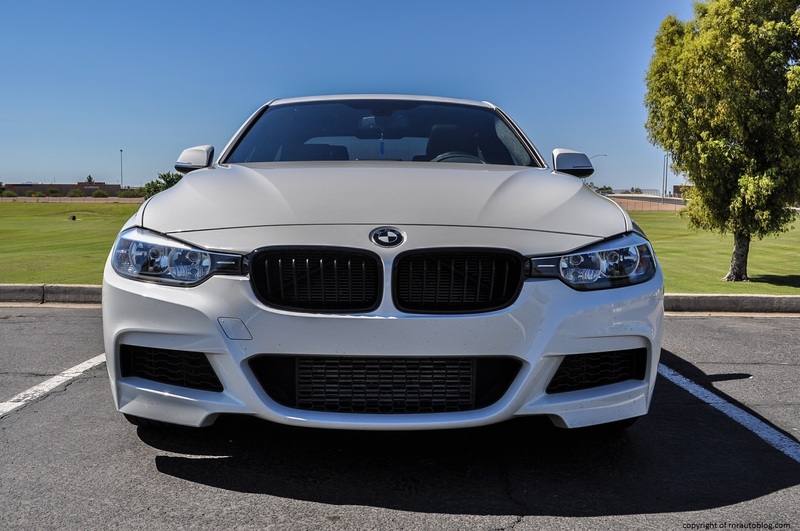 In addition to the loss of BMW’s signature hydraulic steering, this BMW forgoes another BMW traditional feature: the non aspirated inline six cylinder engine. For as long as one can remember, the North American spec BMW 3 series (not including the high performance M3) were always powered by inline sixes. These inline sixes were known for their silky smooth power delivery and their uniquely rev happy nature. 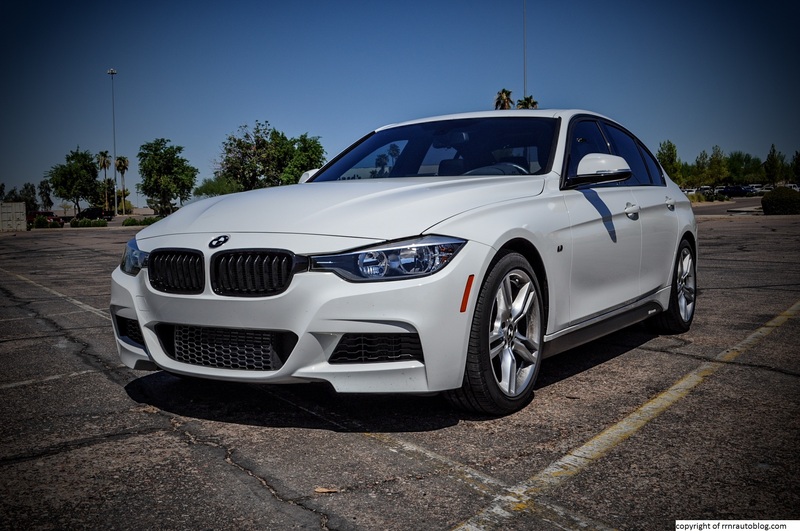 As an attempt to raise fuel economy, BMW introduced a new 240 horsepower 2.0 liter turbocharged four cylinder. 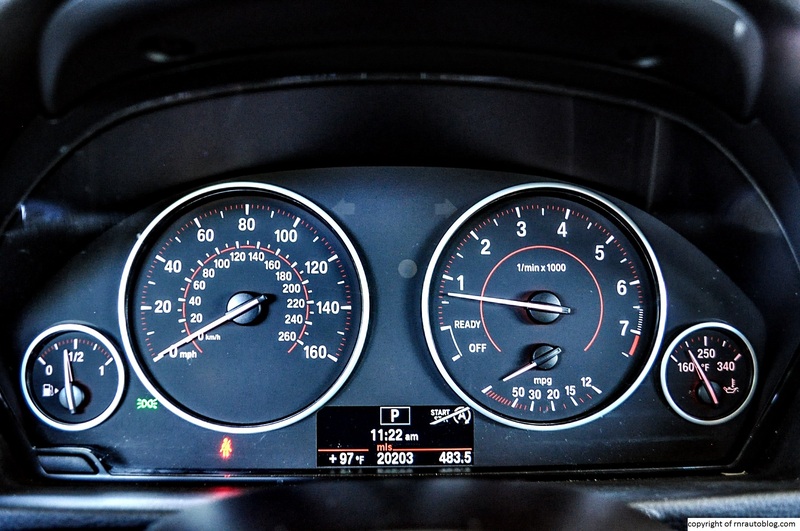 (Fortunately, a turbocharged inline six remains in the pricier 335i). In Europe where four cylinder gas and diesel luxury cars are the norm, this is not unusual. However, in the U.S, this engine change is more controversial, given our appetites for big engines. It is fuel efficient for sure with around 28 miles to the gallon. 28 mpg! My E90 can barely muster 20 mpg, and that is with a light foot. The new turbo four has no problem in the power department. In fact, it actually feels faster than the E90’s inline six. Acceleration is instantaneous, and there is always power in reserve, so you never feel wanting for more power. 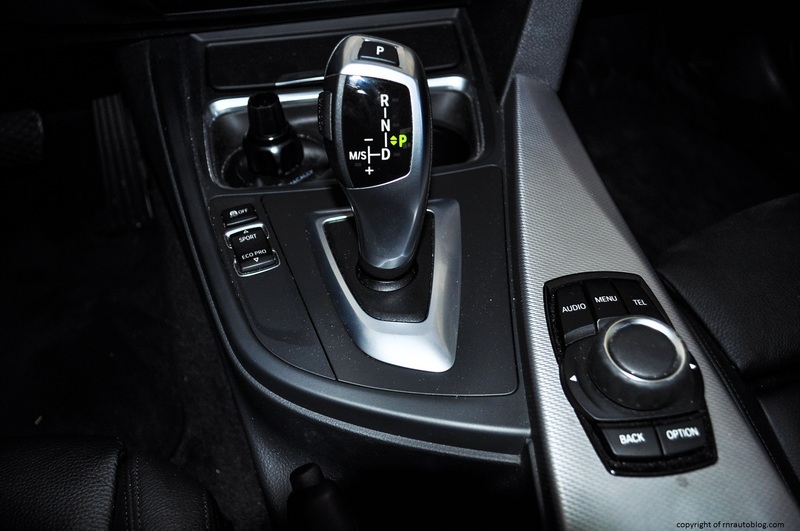 The eight speed automatic transmission is one of the best automatics I have experienced. Its shifts are fast and unnoticeable, and it seems to telepathically predict your next move, because it always manages to be in the right gear for any situation. A six speed manual is optional, and it is the transmission I would choose. However, I do have one caveat, namely the stop start system. Essentially, when the car is stopped, the engine shuts off to save fuel, and it restarts when the brake pedal is released. In theory, it is a great idea, but its execution is very flawed. When the engine restarts, the car shudders very harshly. The stop start system can be turned off, but it is reactivated every time you turn the car on. 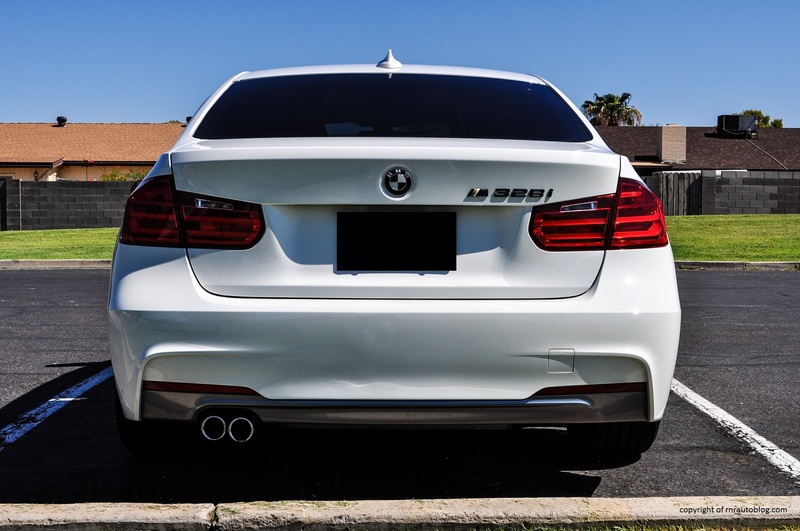 For less money, the 32oi, a detuned 184 horsepower version of the turbo four, is available or if you want more power, there is the pricier 300 horsepower twin turbocharged inline six 335i. One complaint I have about the turbo four is its engine note. Other than the power delivery, BMW’s normally aspirated sixes are known for their muscular sound. One reason I love flooring the E90 is because it produces a low timbre growl. This turbo four doesn’t have a distinctive sound that pressures you to floor it just to hear it. This turbo four does have one annoying trait; it clatters loudly at idle, similar to a diesel, and I have noticed this in other reviews of the 328i as well. Aside from the annoying diesel-like racket, the cabin is quiet with minimal road and wind noise. There is no doubt that the interior is well constructed, but the execution could be better. There are some cheap and scratchy plastics in the cabin, and some controls feel brittle. The M Sport package brings 10 way sport front seats and a sport steering wheel. With the 10 way front seats, finding an ideal driving position is easy. Speaking of the seats, they are comfortable and provide just the right amount of lateral support to ensure you don’t keep sliding off your seat when turning fast. 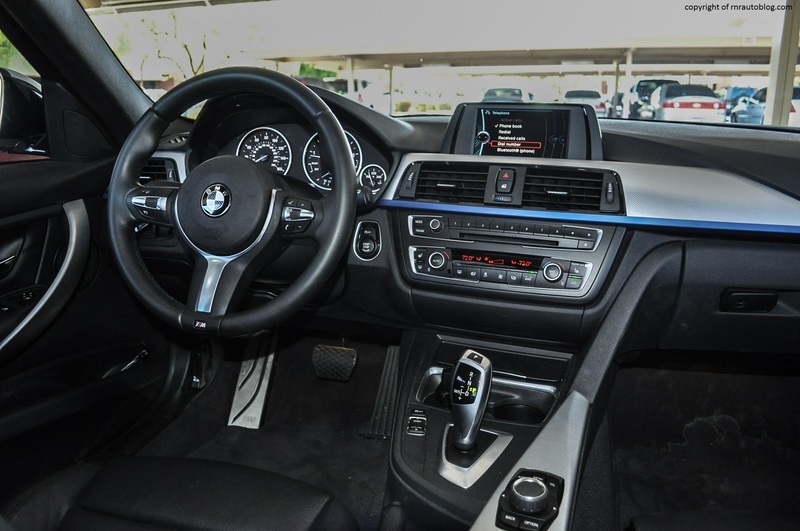 This version is optioned with BMW’s iDrive navigation system. 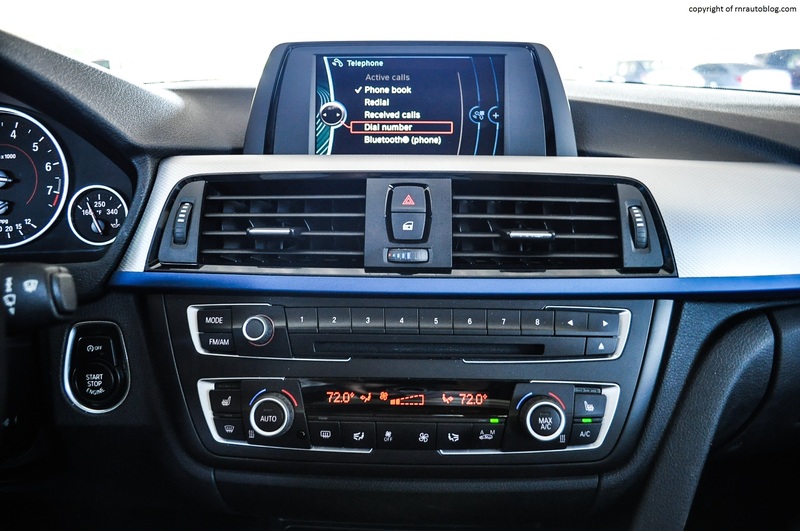 When reviewing BMWs equipped with the system, I always find it to be confusing and daunting. However, in this, it is actually easier for some reason. Initially, it is convoluted, requiring multiple steps for one function, but after some time, it becomes easier. I do wish that the navigation screen did not look like an afterthought. The radio and dual zone climate controls work well, and the gauges are legible. The upright roof line affords generous headroom, and the over your shoulder vision is solid. The rear seat remains slightly cramped, but it is better than previous generations, and the trunk is a suitable size. Getting in and out of the car is an easy affair, and there is some cabin storage. Thankfully, BMW has ditched the flimsy pop out dash cup holders in favor of conventional cup holders. BMW’s annoying cell phone shaped gear shifter remains. To go into reverse, you shift forward, and vice versa for drive. But for Park, you shift to neutral and press the button atop the shifter. 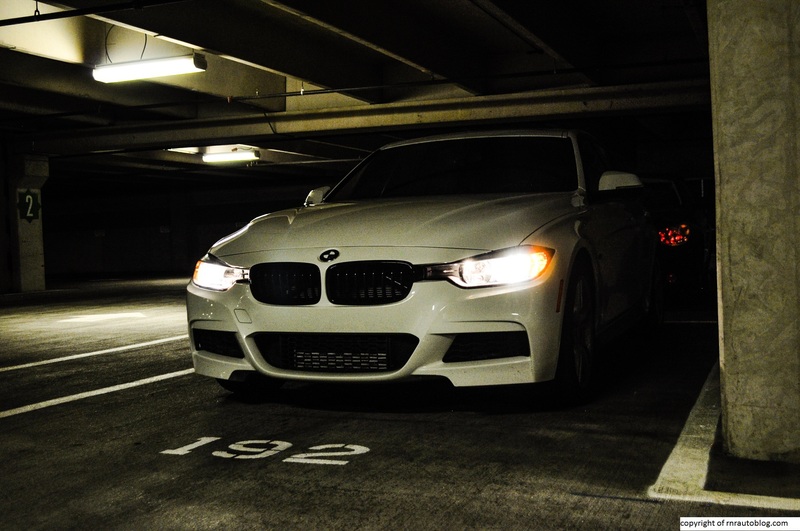 Like I said, I arrived to review this F30 in an E90, and I left in an E90, placing the F30 under heavy scrutiny. 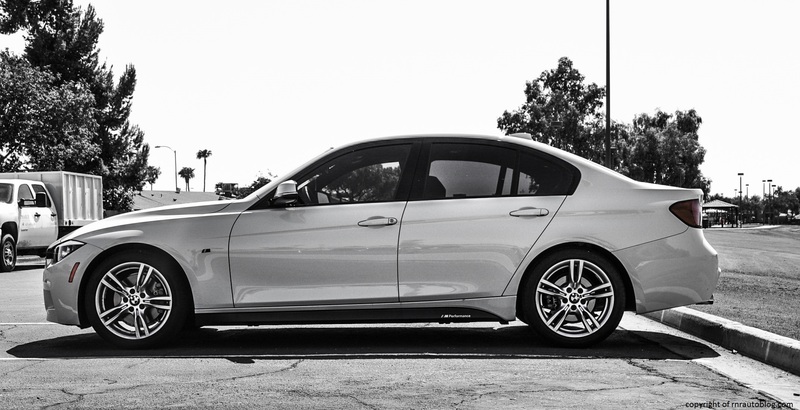 To be honest, this 3 Series is a fine car, and anybody who owns one is lucky to have one. It is just that I love the E90, so I have high expectations for the F30, especially the driving dynamics. I remember when this car was redesigned in 2012, and car magazines decried at the loss of hydraulic steering and the new turbo four engine. Like I said, it may seem trivial to obsess over a steering system, but the steering is the one thing I love most about driving the E90. 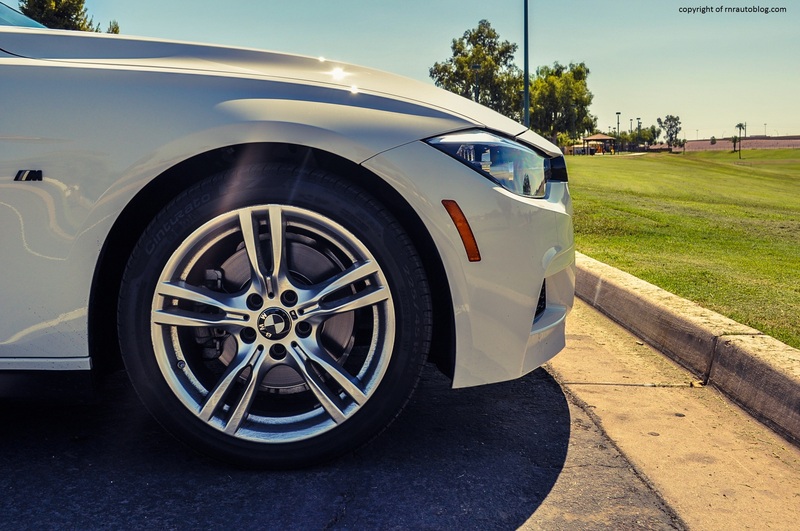 The new electric steering completely transforms this 3-Series. It lost that sensation that made driving a BMW so unique, and you just get the feeling that you are driving a normal luxury car. 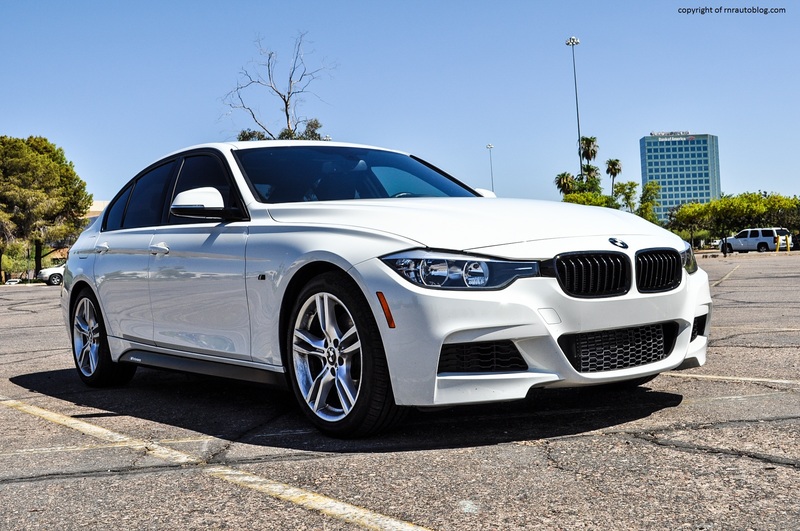 This 3 Series might fall in line with BMW’s new comfort oriented approach, and it may please more people than the older 3’s ever did, but for driving pleasure, it is lacking. With that said, this F30 ticks all the right boxes: it is fuel efficient, it has edgy styling, it has power, it handles well, and it rides comfortably. It is a fun car, but it doesn’t feel as fun as my E90. 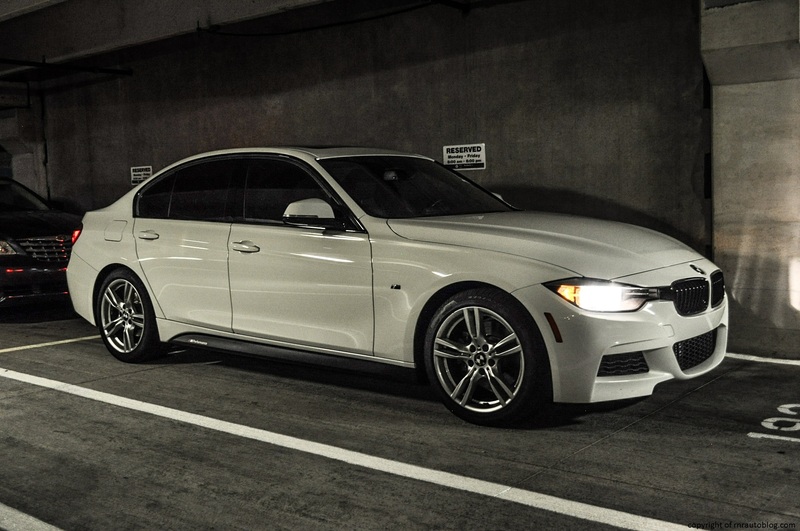 The F30 feels more grownup, and I am not ready to grow up.